Unexpected discoveries on the brink of old age include this: being pregnant with a breech baby is very like voting in a British General Election. Despite appearances, I am not pregnant myself; but my wife unmistakably is. And our baby, due in February, is resolutely refusing to adopt the approved position for a conventional delivery, despite increasingly voluble encouragement to do so. Mrs Hann reckons that this can only be because he is stubborn to the point of self-defeating bloody-mindedness, like his elder brother. I am genuinely unaware of anything in their genetic inheritance that could account for this profound flaw in their characters. In case you are wondering, the similarity to voting in a General Election is that medics keep outlining various ways of dealing with the problem, and my wife’s reaction is the same as mine when confronted with a ballot paper: she does not fancy any of the above one little bit. Whether that be performing origami on her womb before delivery, extracting the baby by Caesarean section or simply allowing nature to take its course (with special emphasis on how they would respond if the infant got stuck on his way out, as breech babies are apparently more prone to do). Sadly, Mrs Hann does not have the option of spoiling her ballot paper and walking out of the polling station in disgust. One way or another, a decision has to be made quite soon on how to bring young Jamie into the world. So tomorrow we are going to hospital for our consultant’s Plan A: attempting to turn the baby around inside his mother. Easy peasy lemon squeezy: what could possibly go wrong? This comes with plenty of caveats. It will be painful. It may distress the baby or damage the placenta. 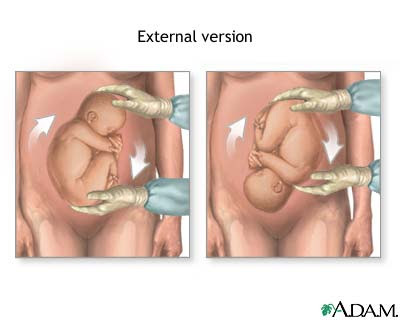 It could even induce premature labour and require an emergency Caesarean section. Best of all, even if it is successful, there is every chance that the baby could simply turn straight back round again. Particularly, I suppose, if he has already shown form as an awkward little so-and-so. Luckily the doctor was quick to set my wife’s mind at rest when she said that she had read that the chances of this happening were as high as 50%. “No, no, it’s much closer to 40%”, came the confident reply, as though that made it pretty much a dead cert. The baby is scheduled to be induced before full term in any case, because Mrs Hann has gestational diabetes, and this happy event has already been pencilled in for Friday week. I saw the light bulb clicking on above my wife’s head. So are the great life-and-death decisions of our wonderful health service arrived at. For some reason my mind wandered off at this point to that South African hospital where unexplained deaths in the intensive care unit turned out to due to a cleaner disconnecting the life support machine to plug in her vacuum cleaner. Though that is probably an urban myth, as most good stories turn out to be. I do not know why women willingly put themselves through all this, and I certainly do not know why so many of them volunteer to do it more than once. Particularly in our case, when I kept leaving all those magazine articles about happy only children so prominently lying around, and even made one the home page of our computer. Thoughts and prayers are with Mrs. H, the baby and your oh so sympathetic self.